It’s been really quiet on this page. Not because nothing has been happening, quite on the contrary, life has been so eventful that at times I felt the only thing left to do was to stick to the Zen Master’s adage: "He who knows, does not speak. He who speaks, does not know." Now I will be the first to admit that generally I do not know much and am therefore condemned to a life of uttering strings of syllables which, with some success I hope, are meant to amuse and confuse you, my dear readers. To bring forth a glimmer of a smile on your countenance would be all that I could ask for my words to produce. My photos, on the other hand, I hope will have a more profound impact. It is said that a picture is worth a thousand words but what an insult to photography that is! 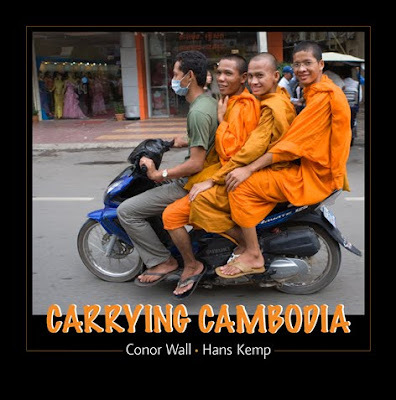 And so without further ado I am pleased to announce the forthcoming arrival of my new book: Carrying Cambodia.